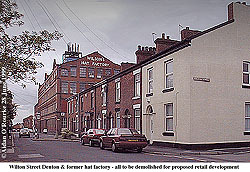 This photo was taken on Tuesday morning (29Jun99) and replaces the picture of St Peters Square posted Monday night. DENTON is a place people often drive through - whether on the M67 or the A57 - but if you bother to stop and look around, as I did today, you'll find a town with a lots of history, a great feeling of community and a growing sense of civic pride. Local Councillor Andrew Gwynne showed me around. Located six miles (9.5 km) east of Manchester, Denton lies on the intersection of two historic highways: the A57 east west from Manchester to Hyde and the A6010 north south from Ashton to Stockport. The intersection of those two roads is Crown Point, named after a 1759 British victory in North America. From here, frequent buses go to and from Manchester and other destinations. There's no nearby rail link with Manchester. See the excellent local history books by writers Jill Cronin and Frank Rhodes. Just up the road from Crown Point, the M67 sweeps underneath, cutting a six-lane swathe through the town. The River Tame takes its meandering course to the east and south before joining the Mersey at Stockport. These rivers used to mark the old county boundary. A 19th century inscription in the middle of the A57 bridge confirms this: Hyde, Cheshire to the east, Denton Lancashire to the west. In 1974 these and other towns joined together to form the Borough of Tameside. First impressions of Crown Point are of a busy town centre criss-crossed by heavy traffic, with a variety of smaller shops, a market and some pubs, including the Crown Point (originally the Kings Head), the Red Lion and the Toll Point. On closer inspection, some of the shop fronts and buildings are a little run down- evidence of the economic decline of past years. For centuries hat making was the major industry in Denton, and there is much evidence of this: Three pubs named the "Jolly Hatter" and two former hat factories close to the town centre. At the height of the hatting trade, Denton was a prosperous place, but by the 1970's, the industry had died out. Today, two major factories make batteries and toilet seats. Nowadays, things are improving in Denton: Local government decentralisation means that district assemblies are being set up all over Tameside. The Town Hall is to be refurbished and the old council chamber will be reinstated. As Andrew Gwynne says, it's taken them 25 years to return to where they were in 1974. The neighbouring Victoria Park is also being refurbished - today they were hanging flower baskets on the grade two listed bandstand, and I was able to get this high level view from an access platform. Denton is twinned with Montigny le Bretonneux, a new town south of Paris. Andrew tells me the French visitors are very fond of Denton as, unlike Montigny, it has lots of history. 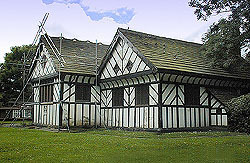 Just down Stockport Rd, you'll find St Lawrence's, the oldest timber-framed church in Greater Manchester. The Festival Hall, on Peel St, just across Manchester Rd was paid for by the wealthy Scott family, and now houses the local library, which has a local studies section. Hyde Hall, located outside Denton to the south west - is named after a family, not the town. It's an old timber-framed manor house, dating from the sixteen century, and is now used as a private residence, so unfortunately you can't visit it. On the other side of the motorway going towards Hyde, is the conservation area of St Anne's Church, including the school and rectory. The church was built over 100 years ago by hat manufacturer Joseph Sidebotham, a keen photographer. Unfortunately, the motorway has cut it off from neighbouring farm buildings, though a tunnel allows cows to cross underneath. Economic regeneration is coming to Denton. A new business park is to be built on a large site to the north of the motorway. Unfortunately, the old Wilson's hat factory and neighbouring buildings will have to be demolished - it's a shame but this, it seems, is the price of progress. To the east of Denton lies Haughton Green. The two districts joined to form a single Urban District council in the 1890's. 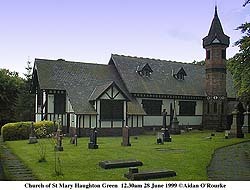 Haughton Green was a quiet rural area, but in the 1960's, Manchester City Council bought neighbouring land and built a large overspill estate. Though the community there is stable, old Haughton Green residents still resent the council estate. Standing in front of the Church, to the right you see a pleasant village scene, but to the left are high rise blocks and council houses. Not far away are pleasant riverside walks along the Tame valley. 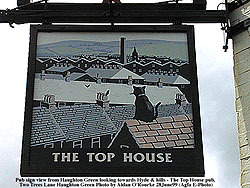 Built on a hill above the River Tame, Haughton Green has good views of the surrounding hills, though today it was rather grey and cloudy, so I'll show the view as depicted in this attractive pub sign instead. Just down from here is the mid-18th century Manor House Farm, still used as a family home. Back in the town centre, it was time for me to leave Denton - another corner of Greater Manchester with more history and tradition than I expected, though some of it will be gone when I return to see the Town Hall after refurbishment. Also: "Looking Back at Denton"
"TONY BANKS BACKS MANCHESTER" is the headline in today's newspaper which caught Andrew Gwynne's attention. The outspoken London MP who is Minister for Sport said that the Commonwealth Games would be a credit to the city and the country. He was speaking at a Labour Party fundraising event at Gorton Labour Club last Thursday, which Andrew attended: "He was very positive but I hope we get government backing for the Games. The Council Tax payers of Manchester shouldn't have to foot the bill." Incidentally, Andrew has met Prime Minister Tony Blair on two occasions. OTHER CURRENT NEWS ITEMS - Drivers in Manchester city centre beware! From today, clampers are in operation, and will clamp your car if you park illegally or over-stay your time on a parking meter. It's part of the council's campaign to combat city centre traffic congestion, but traders are complaining the new regime is driving customers away. THERE WAS A FIRE in Manchester city centre on Saturday - it struck the W H Smith's store on St Ann's Square, and a large number of firefighters were needed to deal with it. WHERE CAN YOU BUY TWO HOUSES for £9000, plus a third one thrown for free? In the blighted Langworthy area of Salford, famous as the inspiration for Coronation St's Weatherfield. A vicious circle of unemployment, crime and an exodus of residents to other areas has created a "black hole" at the centre of Salford, just a stone's throw from the prosperous Salford Quays. According to tonight's BBC1 Panorama programme, there's a new migration from north to south. The programme also featured Tom Bloxham and Urban Splash, one of whose refurbished apartments is the same price as a whole row of houses in Langworthy. THE MANCHESTER MELA took place in Platt Fields Park over the weekend - Mela is a word of Indian origin meaning festival or celebration. A large number of visitors came from all over the north west to ride fairground attractions and sample food from Asian food stalls. THE NEW BODDINGTON'S GIRL is an animated cyber-babe, who will take over from the stunning Ango-Indian model from Mossley, Melanie Sykes. Claudia will be featured in a TV advert which will be screened from 12 July onwards. Can't wait to see it. Boddington's Bitter is Manchester world-renowned beer, available even even in the remotest parts of North America and Australia, so I'm told. IT WAS HOT AND SUNNY on Friday and Saturday. But the heat brought tragedy to a family in Dukinfield. Their baby girl died after being left in a hot car. Many signs nowadays warn us not to leave animals in parked cars during hot weather - that applies to small children as well. Sunday started off with rain and drizzle, but later in the day it brightened up, and I got some spectacular views from this hill not far from Manchester city centre - can you identify it? 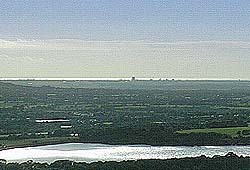 I was amazed that to the north west I could see the Irish sea and Blackpool Tower, to the south west Liverpool docks and the Welsh mountains, and to the south east, the Manchester conurbation. Today was mostly cloudy, with rain around lunchtime. This afternoon was cool with sunny periods. Join me later in the week for another update, this time from Manchester city centre - I'll be alternating between the suburbs, the centre and once in a while, a day trip to somewhere exotic, like Chester.